David Fideler: It’s very nice to be here speaking with you. Joanna: I will jump right in. The world has a soul? David: Well, yes. That was the traditional Greek view of the world and the cosmos. And for a large part of the history of the Western world — say for around eight hundred years — that was really the normal way to look at the world: that our planet and the entire cosmos was ensouled, and a living entity, and a reflection of intelligence. Joanna: Well I think it’s the moment now, more than ever, that if the mechanistic view — the Cartesian view — wins, then we are lost as a people. So speak to us about the organic view of the universe. Upcoming talk by David Fideler, sponsored by the Temenos Academy. Venue: The Royal Asiatic Society, London, Monday, June 27, 2016, 7:00–8:30 PM. Admission: £8. According to Plato in the Timaeus, the universe is “one Whole of wholes” and “a Single Living Creature that contains all living creatures within it.” And it was first in the Timaeus that Plato described the World Soul—literally, the soul of the cosmos—as the intelligent and harmonious principle of proportion or relatedness that exists at the heart of the cosmic pattern and allows the living world to unfold in the best possible way. In this highly illustrated lecture, David Fideler traces the history of the World Soul, and the related idea of “the community of the cosmos,” from Plato, through the Stoics and Plotinus, up until the present day. With the coming of the Scientific Revolution in the sixteenth and seventeenth centuries, the world came to be described as a lifeless, clock-like mechanism, and all intelligence came to be seen as existing only in human beings, or the detached, theoretical God of deism, who had no living connection with the universe. This led to a profound sense of alienation, since human beings no longer had any real bond with the world. While the Romantic poets and philosophers rebelled against the mechanistic worldview, later scientific discoveries went on to undermine every fundamental premise of the Newtonian worldview, and have recently reintroduced ideas suggestive of living nature and nature’s intelligence. 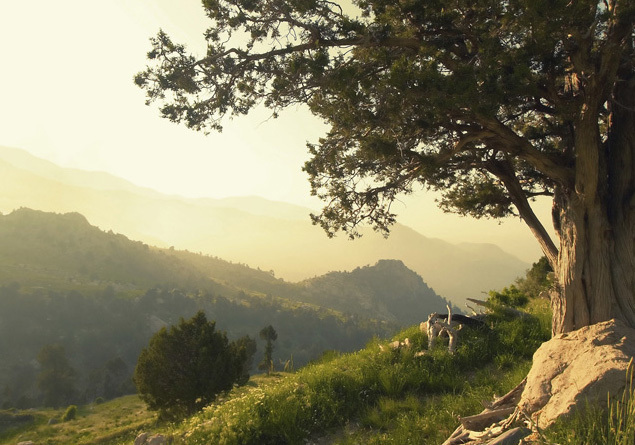 This talk explores the important cultural implications of this shift taking place in worldview, and how our creative engagement with nature’s intelligence is not only important for well-being as humans, but for the flourishing of all life on Earth. David Fideler studied ancient Greek philosophy and Hellenistic religions at the University of Pennsylvania and holds a PhD in philosophy. His recently published book, Restoring the Soul of the World, offers a history of the World Soul and nature’s intelligence in the Western tradition, exploring its cultural significance. A recognized authority on the Pythagorean school, Fideler contributed the article on Pythagoras and Pythagoreanism to The New Dictionary of the History of Ideas, and is the editor of The Pythagorean Sourcebook and Library. He lives in Sarajevo with his wife and son. Prince Charles published a beautifully illustrated essay in The Architectural Review on the need to rediscover the sense of harmony that binds together nature, humanity, and architectural design. This can be achieved by understanding and drawing upon the harmonies reflecting in nature’s order, based in part upon geometry, which was an important study for hundreds of years in our Western tradition. I had waited years and years to visit the ancient site of Plato’s Academy in Athens. And now, finally, the moment was here. This was my first full day in Athens. The conference we organized was set to begin the next day. And now was my chance to slip over to the Grove Academus with two friends, David McConville of the Buckminster Fuller Institute and Jean Gardner of the Parsons New School for Design. The weather in the morning was perfect. Rain had been predicted, but the sun was hot with blue skies. 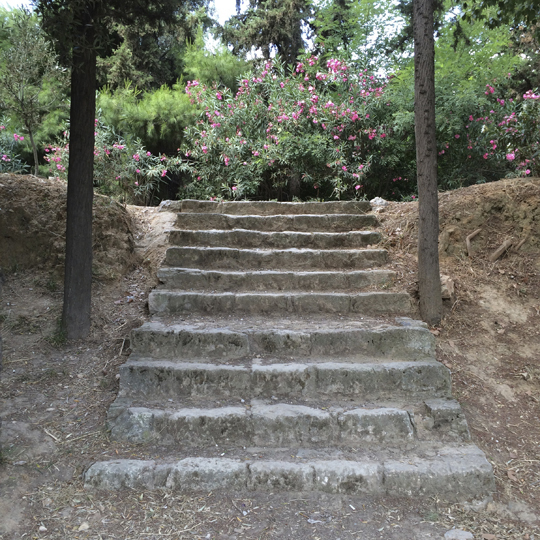 Stairs leading to the gymnasium near the site of Plato’s Academy in Athens. We left at 10:00 a.m. sharp, taking a taxi. I was the de facto guide for one reason. Nineteen years ago I wrote a history of the Plato’s Academy for the Ross School, which gave me a chance to dig deeply and study all the surviving historical information about the Academy: why it was set up, what went on there, and how the school continued after Plato’s death. The park or grove Academus was one of three main parks in ancient Athens. Set on the banks of the river Kephissos, which is no longer visible, it featured the finest trees in the entire city, plenty of shade, and a gymnasium where people could work out. Next to the park, Plato cleverly purchased a small estate, creating the Academy in the year 387 BCE, when he was forty-one-years old. He built a home there, which was also used for the activities of the school, including philosophical drinking parties (symposia) and the storage of manuscripts. This gave the ancient world’s most famous school both a private and public dimension. Scholars associated with the school could use Plato’s property. And they could also use Athens’ most beautiful park and its pathways as a place to take walks and have ongoing discussions. Greek taxi drivers don’t get much call to take modern-day travellers to the site of Plato’s Academy. Ours was able to get us to the general area on Plato Street, but then was lost. Fortunately, I had brought a GPS-equipped iPad with a detailed map of Athens. Watching the blue dot of our car sliding around the streets of Athens on the screen, I gave him directions and we arrived in a couple of minutes. In any case, aside from a couple of people we ran into (and a busy playground on the park’s edge by a street), we were the only ones there. The setting was quiet and contemplative. As we entered the grounds, the Mediterranean sun was hot, but shaded areas provided relief. 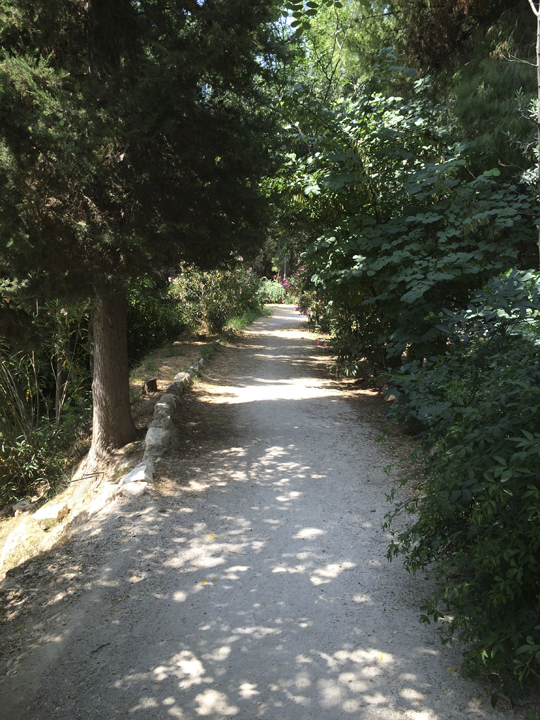 A shaded pathway near the site of the original Platonic Academy. Walking around, we started to see the archaeological remains of ancient buildings. No one knows today where Plato’s home next to the park was exactly located, even though the school he started lived on for about three hundred years. After his death in 347 BCE, Plato was buried there, and a statue of Plato created by the sculptor Silanion was erected near his grave. Wherever Plato was buried, we certainly were very close. 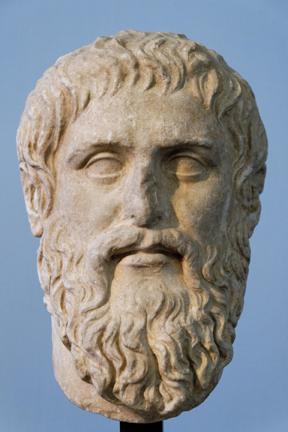 Bust of Plato, after the original by Silanion. The most impressive archaeological site in the park is the remains of the gymnasium building, which dates back to the time before the Academy. Stately old stone stairs lead down to the gymnasium, and I was repeatedly drawn to their lines, symmetry, and simple elegance. 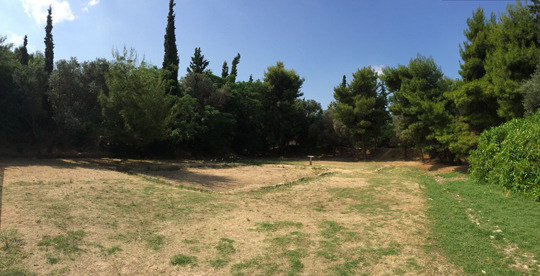 Panorama showing the foundation of the gymnasium in the park Academus, near the site of Plato’s Academy. Plato’s Academy was a center for research into mathematics, and most of the material that was compiled later by Euclid is thought to have been worked out there. But Plato’s motivation for starting the Academy was to improve society. For Plato, the goal of all education was to understand the nature of goodness, so it could be made present in society; and the role of the philosopher was to study the order and harmony of the cosmos, so that could be cultivated as a model in personal and civic life (Republic 500c–e). As we wandered through the park, we wondered: Where was Plato buried? Where was his house? And we also thought about the other great figures of the Academy, in addition to Plato, whose footsteps we were now tracing. People like Aristotle, who studied with Plato for seventeen years before starting his own school. Eudoxus of Cnidus, a Greek mathematician and astronomer, who Plato inspired to devise one of the first models of planetary motion. And Euclid, who worked at the Academy after Plato’s death, where he compiled his famous Elements of Geometry. Then something else happened: We started to spontaneously discuss ideas, and our situation in the world today. As we walked through the Academy, we actually began to philosophize, and started a conversation that lasted for nearly five hours. Unlike the modern word academic, which often means “of limited intellectual interest, and no relation to the real world,” Plato started the original Academy to educate potential leaders so they could improve society. 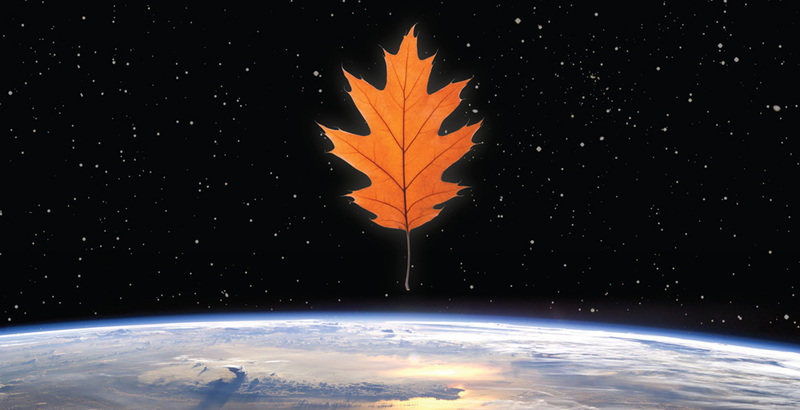 And walking in his footsteps, our conversations focused on real-world topics: How, just recently, 60,000 scientists have concluded that too much specialization is harming the world, and how they are now trying to do something about it with an interdisciplinary project called Future Earth. How the entire Western quest to understanding our solar system started in the place where we were walking — an inquiry that spanned thinkers like Ptolemy, Copernicus, Kepler, and Newton. Whether or not we had reached a “terminal condition” in the humanities, and how the humanities have now departed from the original vision of Renaissance humanism, of being a practice that leads to deep forms of human flourishing. How ideas are not disembodied abstractions, but at work in living systems. 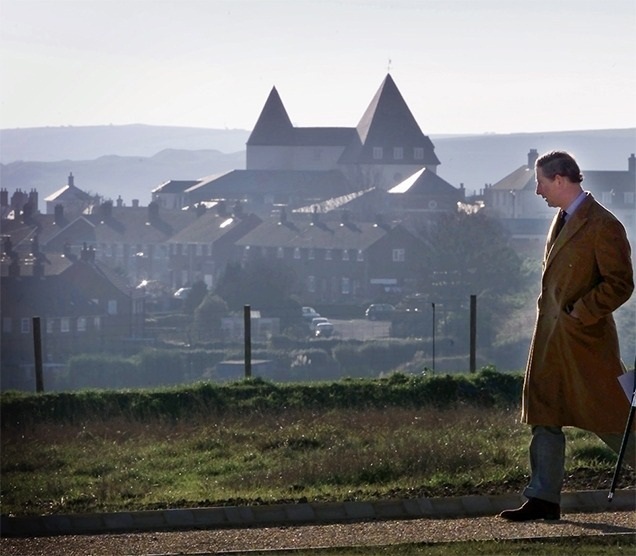 How place is important, in both creating our most pressing problems and in solving them. Whether or not the original spirit of the humanities can still live on in the academic world, or only outside? The questions went on and on. As we walked across the park Academus, we headed for a little point on my map, located right across the road from the park. I’d noticed it a few days before traveling to Athens. According to the map, there was a coffee shop there called Akademia Platonos — “Plato’s Academy.” Parched by the sun, we needed a cool drink. And with a name like that, it was certainly worth checking out, if only for a bit of fun or a silly photo. When we arrived at the coffee shop, it wasn’t quite open. 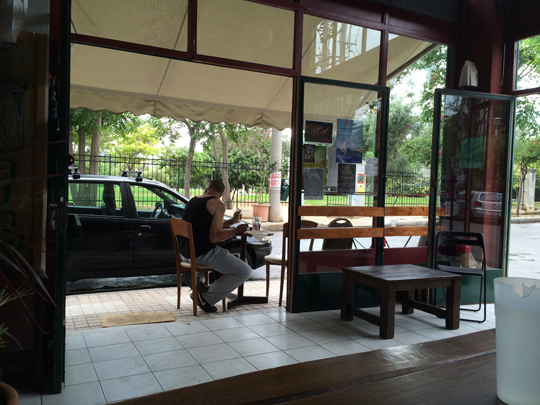 Chairs were stacked on tables inside, but someone cheerfully opened the café up for us. One fellow was sitting outside, smoking. A beautiful young woman in her twenties, who looked vitally present and engagingly intelligent, played and interacted with an equally handsome dog. She invited us in. We got our drinks, grabbed chairs, sat outside, and the conversations continued. Taking our drinks outside, our discussions went on and on, in this beautiful setting, right across from the Grove Academus. And slowly, something started to dawn on us. We had been talking for some time about how place was so important, and here we were in that special place, where the entire Western tradition was really born. (As Alfred North Whitehead noted, “The safest general characterization of the European philosophical tradition is that it consists of a series of footnotes to Plato.”) And as our conversations went on for hours, we slowly began to realize that we were reenacting the activity that took place in the original Academy. In Plato’s Academy, no classes were offered. Learning took place through sustained discussions, as members wandered throughout the park and sat in nearby locations. 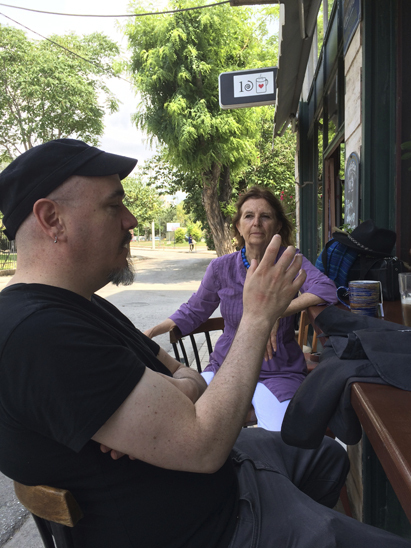 Our discussions continued outside the Plato’s Academy café. David McConville (Buckminster Fuller Institute), left; Jean Gardner (Parsons New School for Design), right. As the day went on, the weather changed. Hot sun turned to wind, dark clouds, and light rain. Then the sun returned. As we talked, the handsome dog chased several trucks down the street, barking loudly. The beautiful woman chased the dog, running after him with a leash. It certainly seemed like a game. We started to feel totally at home, watching the day unfold, watching strange vehicles drive by (a “mobile store” on the back of a truck with a P.A. system selling furniture! ), and the shifting weather. This felt like my new home, my new neighborhood. I knew, some day, I would return. View of the park Academus, across the street, from inside the café. Eventually, we became quite hungry and went inside to discover that food was available. We ordered several dishes to share: a salad, a rice dish with lentils, a large plate of fresh humus, and other items. I finally broke down and ordered a large cappuccino. After bringing it to my table, the person who made it humbly questioned whether or not it was any good, expressing doubt over the quality. In fact, it was the best coffee I’d had in months, or maybe ever. Walking by a counter next to the window, I saw some flyers, including a colorful announcement in English for some classes, called “THE BIG PICTURE Workshops,” offered by Jennifer Hinton. We didn’t know her, but after reading the flyer, I realized she should have come to our symposium. The leaflet included a colorful logo of interconnected geometric nodes, and offered “Practical tools for co-creating a more sustainable future.” In short, the workshop offered training for social entrepreneurs who wanted to create positive change in the real world — a topic we had just been discussing. 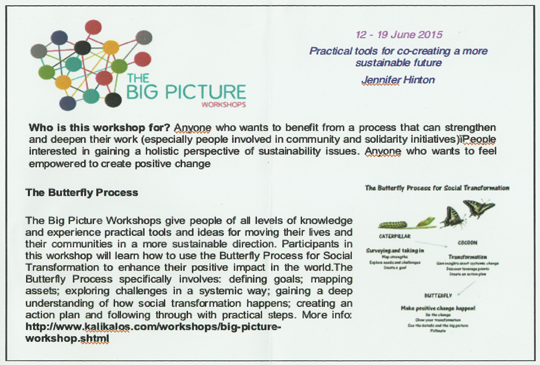 Flyer for “THE BIG PICTURE Workshops” on social entrepreneurship. I was quite surprised to discover this leaflet in Plato’s Academy. Just moments before were sitting at that exact spot where the flyer was located, but on the other side of the glass windows, discussing those exact topics — the big picture, networks, nodes, and social entrepreneurship — and using those exact terms. It was a remarkable coincidence, and I showed the flyer to David McConville and Jean Gardner, who also took copies. A few minutes later, Jean showed us an image she had stored on her cell phone, similar to the colored nodes on the flyer. And the next day in my presentation, which was already written, I would quote a line from a talk of David McConville, “The radical fragmentation of knowledge is making it difficult to understand any kind of big picture.” We hadn’t planned it, but all the pieces were beginning to fit together. After seeing this flyer, the idea that Plato’s Academy was a meeting point for this kind of thinking grew more exciting and more palpable. That was the case in the ancient world too, because Plato himself was the ultimate big-picture thinker. As he wrote in one of his most famous works, the universe is “one Whole of wholes” and “a Single Living Creature that contains all living creatures within it” (Timaeus 33a and 30d3–31a1). Our discussions continued over coffee and delicious food until the day grew late. 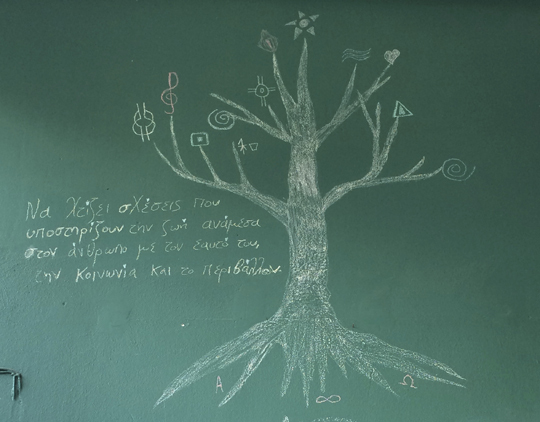 The symposium that we had come to Athens for, “The Humanities, the Experience of the Transcendent, and the Future of Higher Education,” was set to officially begin the next day. And while it wasn’t planned this way, I could now see that the symposium had really begun one day early, in the evocative setting of Plato’s Academy. But now it was late. We had to leave, to meet our colleagues back at the hotel, so we could share a common dinner and start off the event. As we were getting ready to leave the café, set in the midst of the Greek economic crisis, the Egyptian fellow who made the food told us something important, which stopped us in our tracks. Hearing this felt a bit overwhelming, especially with the situation in Greece. It illustrated the way the Greek people are reinventing both their economy and their culture in this time of crisis. And it was happening here, at Plato’s Academy, right before our eyes. Once we learned this, we left a generous pile of euros behind, probably more than twice what we would have normally paid. Why did we do this? I can only speak for myself, but think the feeling was mutual. First of all, I wanted to make sure that the homeless woman would continue to receive her coffee. And second, I wanted to make sure that Plato’s Academy would still be around, should I ever return in the future. 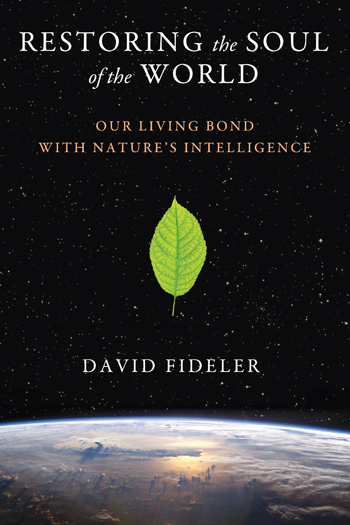 David Fideler, co-organizer of the symposium, is editor of the Cosmopolis Project website and author of Restoring the Soul of the World: Our Living Bond With Nature’s Intelligence. Session from the symposium, “The Humanities, the Experience of the Transcendent, and the Future of Higher Education,” Athens, Hotel Titania, June 19–21, 2015. 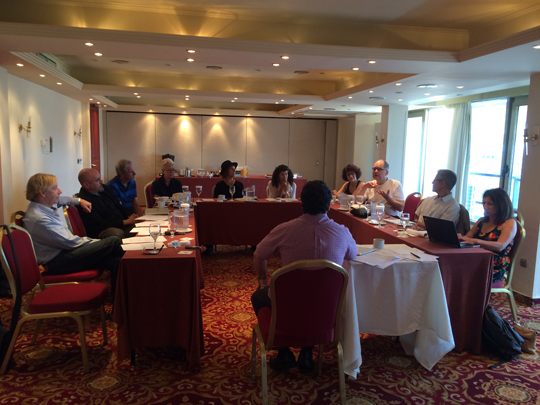 The official symposium, “The Humanities, the Experience of the Transcendent, and the Future of Higher Education,” took place in Athens, Hotel Titania, June 19–21, 2015. Over the course of three full days, we had nine presentations, listed below, with plenty of time for formal and informal discussions. 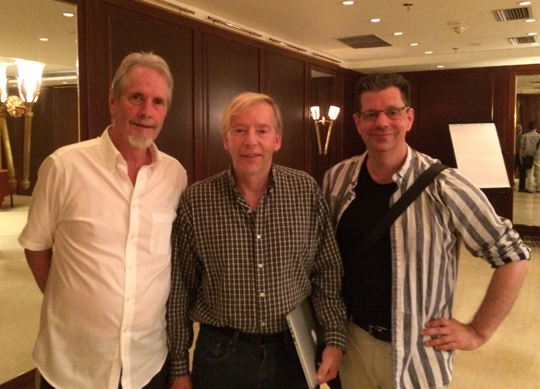 James Cowan (left), Arthur Versluis (center), and David Fideler (right) at the conclusion of the symposium. In the future, a book based on the presentations may be published. To learn more and receive future announcements, please join our mailing list. The symposium will consist of ten to twelve participants offering 45-minute to one-hour presentations that relate to the themes of the symposium. Our dialogues will be recorded and the presentations will form the basis of a forthcoming book. Provisions will also be made for people who cannot attend the event to share their ideas. The symposium will be held at the Hotel Titania in Athens, June 18–21, 2015. 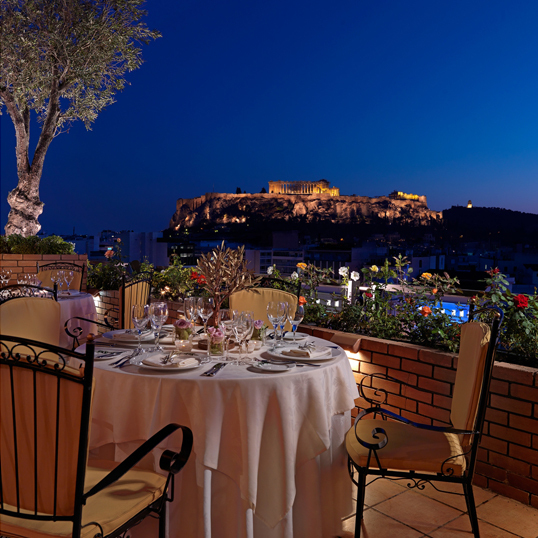 The hotel features excellent facilities with a view of the Acropolis and offers moderately priced rooms at 85 euros per night. If you are interested in joining us for the symposium, please send us a short description of your intended presentation. Include the title, a short description, your contact information and organizational affiliation, and email it to: athenssymposium2015@gmail.com. All proposals must be received by February 28, 2015, and the symposium program will be finalized shortly after that date. The symposium is being cosponsored by the Cosmopolis Project and the Association for the Study of Esotericism. 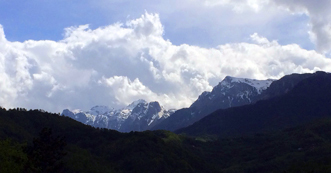 To receive further information on the event, including how you can participate by sharing your thoughts and questions, please subscribe to the occasional newsletter of the Cosmopolis Project on the right sidebar of this website.